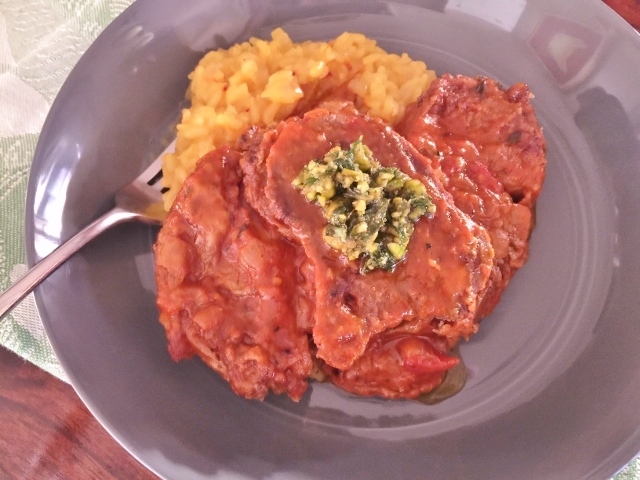 Osso Bucco with Basil Gremolata - Recipe! - Live. Love. Laugh. Food. Osso Bucco is a classic Italian dish prepared with veal shank and slow roasted in liquid until it is almost fall-off-the-bone tender. 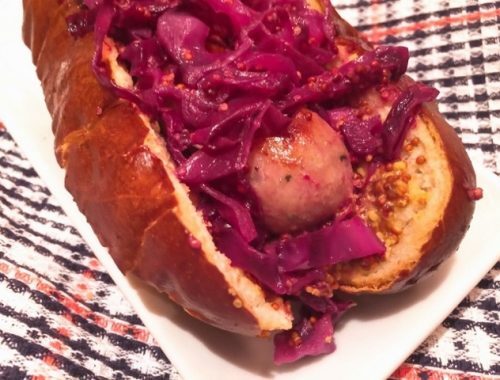 This dish is comfort food to the maximum, not too heavy, with all the right balance of flavor – it tastes like heaven straight from your kitchen. The sauce with vegetables, broth and wine, cooks down into a auburn delight and baths the succulent meat gently. After cooking, the broth is strained and you are left with the most magnificent accessory to showcase the tender veal. This meal isn’t difficult to prepare and it makes the perfect dish for the weekends when you’re home for a little oven time. I like to serve my Osso Bucco with Risotto Milanese (recipe on blog), or mashed potatoes, sauteed spinach or plain rice. 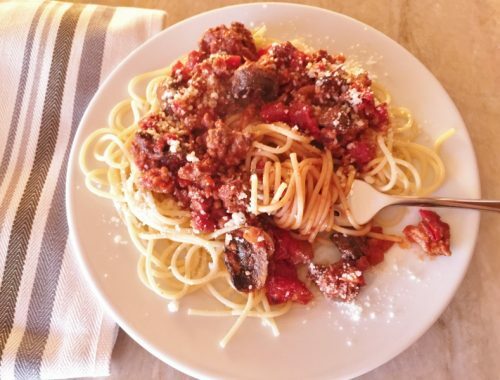 The meal is one of my favorites – delicate, meaty and really nice to share with friends – ask them to bring the red wine. 1. Preheat oven to 350 degrees. In a dish, add flour, 1 teaspoon salt and 1/2 teaspoon black pepper. Toss shanks in flour mixture and coat lightly. In a Dutch oven with fitted lid, add 1 tablespoon butter and 1 tablespoon olive oil and place over medium high heat. 2. Place shanks in pan and sear on each side for 4 minutes. Remove shanks from pan, set aside. Add carrots, celery, onion and garlic to pan and saute for 4 minutes. 3. Deglaze pan with white wine, stir to incorporate any bits from bottom with spoon. Add tomato paste, tomatoes and chicken broth, stir. Add shanks back into pan and their juices. Place thyme and oregano in pan. Cover pan with lid and place in oven to cook for 1 1/2 hours, add more time if your shanks are thicker cut. 4. When fork tender, remove shanks from pan and set aside. Remove herbs and vegetables with a slotted spoon, discard. 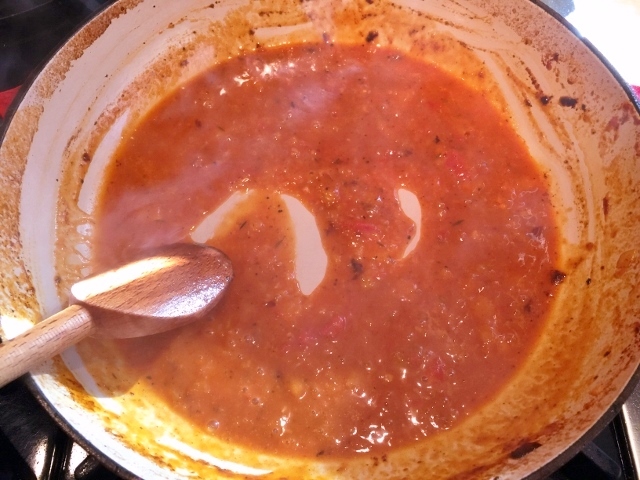 Place pan over low heat and cook sauce until reduced slightly, about 3 minutes. 5. 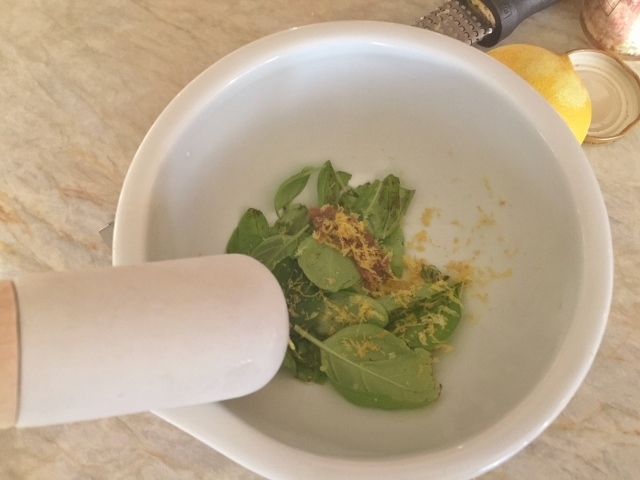 To make Gremolata, place basil, lemon zest, anchovy and salt into a mortal & pestle or small bowl. Mash until coarse mixture, then and add pistachios and olive oil, mash again until combined. 6. 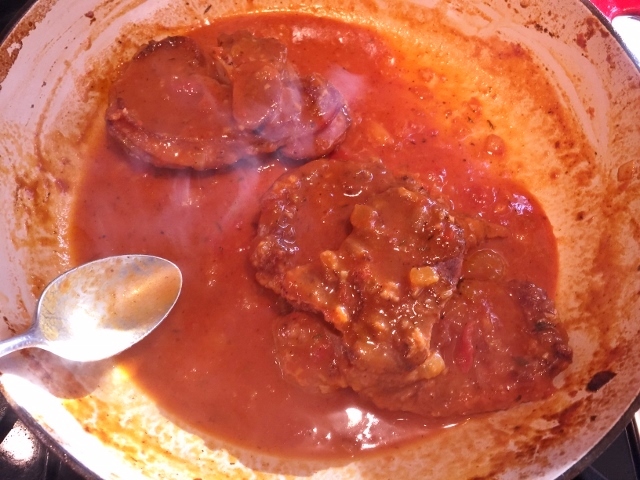 Place veal back into pan and spoon sauce over meat to coat. When ready to plate, add shanks on top of risotto or potatoes, top with a teaspoon to Gremolata, Enjoy! 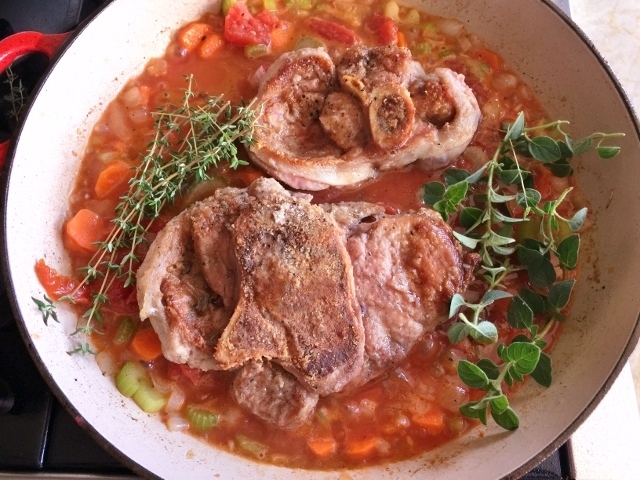 Comfort Food Recipescooking with Gena BellHow to make Osso BuccoItalian RecipesOsso Bucco RecipeOsso Bucco with Basil Gremolata - Recipe! 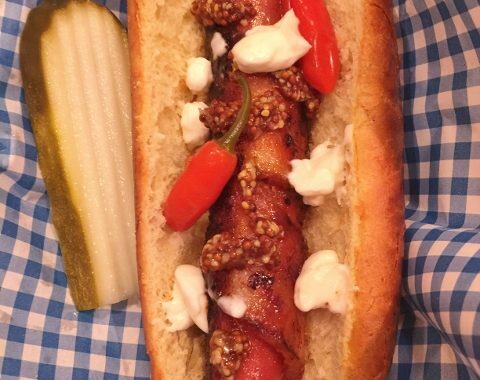 Bacon Wrapped Sriracha Dogs – Recipe!